You get a call. It’s from your dad. He’s trying to set up a new printer. (Of course, it’s a printer problem.) You ask him the make and model, and start Googling instruction guides. You’re sure it’s a driver. (It’s always a driver.) You walk him through the steps. He tries to print a test page, and it works. As far as he’s concerned you’ve just performed a miracle. You can hear the appreciation and almost delight in his voice as he thanks you. Why did he call you? It’s the same reason he’d take his car to a mechanic. He had a problem and trusted you to either know what to do or how to figure it out. Desktop support techs are the mechanics of the IT world. People come to you with a problem. They’re frustrated. They don’t know what happened, or whether it was their fault. They just know something doesn’t work that should, and they need you to help. It’s your job to figure it out and make it work. Whether it’s a PC, Mac, Android, or printer. Google is a good friend to any desktop support tech, but it’s not prescient. The search output is only as valuable as the question you ask it. Garbage in, garbage out. You need to know how the parts of a computer interact and how the computer interacts with the network to even start looking for the solution to a problem. That’s exactly what CBT Nuggets trainer Anthony Sequeira teaches in this Intro to IT course. After you watch these videos, you’ll have a basic understanding of hardware, software, and how to become an “IT mechanic”. After you’re done watching all the videos, take the quiz, and post the certificate on your wall. You’ve earned it, but be careful. You’ll soon be the de facto support tech for your entire office, family, and friends. No two days are the same in desktop support. Sometimes you’re digging gum out of a USB port. Other days you’re digging suspect processes out of the registry. But one thing will be consistent. One problem at a time, you’ll be learning. Day-by-day you’ll be creating a bank of solutions to the most common problems. As time passes, you’ll Google less and know more. If you want a fast-paced job, desktop support is the right one for you. Many aspiring IT pros talk about the first job Catch-22. You can’t land a job because you don’t have experience. But you know what? You can’t get experience because you can’t land a job. Certifications can help break you out of that Merry-go-round. Video 3: What Desktop Support Jobs Are Available? Just like no two days are the same, no two desktop support jobs are the same. As you’ll find out in this training, desktop support means many things to many people. But, one thing remains consistent. Desktop support can be a great first job — or even career. A mechanic knows there are three things to make an engine run — fuel, fire, air. Ruling out one potentially means ruling out hundreds of parts. Similarly, desktop support techs need to know the parts of the computer, operating system, and network — and how they interact. That’s troubleshooting. After all, you don’t need to replace the engine when it only needs a spark plug. Video 5: What Technologies Are Used in Desktop Support? Desktop support techs are responsible for everything in the entire office with a screen, including, yes, even personal devices. They have to support a dizzying array of devices, including virtual machines and cloud services. Video 6: What Hardware is Used in Desktop Support? It’s important to know that desktop support techs aren’t just fixing problems. Everything with moving parts needs a little oil sometimes. Figuratively, of course. (Please don’t oil your motherboard.) In fact, computers need plenty of physical maintenance, too. Video 7: What Software is Used in Desktop Support? Just like with hardware, software needs maintenance. You may think there are no moving parts, but that’s not true. Hard drives need to be cleaned. Apps need to be culled. Even memory can use a little tuneup every so often. The operating system controls everything on the computer. Luckily, there are some easy-to-use tools to help you. You know what they say: “An ounce of prevention is worth a pound of cure.” That’s particularly true with security. One of the most important jobs a desktop support tech does is making sure everyone’s software is up to date. Software vulnerabilities can allow bad guys into your system. A machine running an old OS version is like having a state-of-the-art alarm system and then keeping your windows open. Cars have a check engine light. Operating systems tell you when something is wrong, too. Desktop support techs have a whole suite of monitoring tools on Windows. Anthony goes over Performance Monitor and Event Viewer to be proactive. Back in the day, mechanics just worked with mechanical parts. Now, they’re working with advanced computer systems. The same thing has happened in desktop support. It used to be bare metal, motherboards, and operating systems. Desktop support techs increasingly find themselves working with cloud-based services. Most support roles involve some cloud management. Don’t get left behind. Desktop support is among the most fulfilling work out there because you’re working not only with machines but people. Think back to that first call from your dad. He had a problem. You didn’t really know what was wrong, but you figured it out. Now imagine that dozens of times throughout the week. As a desktop support tech, you are a miracle worker. You’re a magician. If you’re doing a good job, then you’ll be the first person they call when there’s a problem. If you’ve ever gotten a call from a family member or friend asking you to help them fix their computer, you’re already well acquainted with life in desktop support. In fact, if you’re getting those types of calls, you’ve already got one foot in the door. 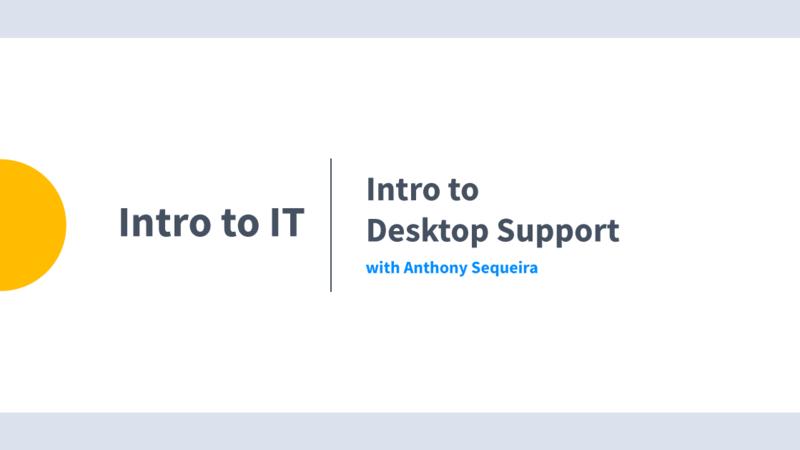 Validate what you learned today by taking the 12-question Intro to Desktop Support quiz. There’s one question from each video. Pay close attention. You need to get 100% to earn your certificate of completion. The quiz isn’t timed, so you can even go back. Sign up at CBT Nuggets for a monthly subscription. The first week is free. Commit to training for 30 minutes a day, five days a week. You’ll be surprised what you can learn in 10 hours per month.